When your heart contracts it squeezes all the blood inside it into a tube (the aorta) that is much smaller in size. That causes pressure. Think of a hose used to wash your car as your heart and the nozzle on the end of it as your blood vessels (aorta). As the water gets pushed into the nozzle from the hose the pressure goes up sky high, which is why the water can shoot so far and feel so powerful, if you put your hand in front of it. So blood pressure is caused by pushing the blood into the blood vessels from the heart. What is the purpose of blood pressure? Before the heart contracts, the pressure inside it is around zero. As it contracts the pressure increases until it reaches a certain level that forces the valve to the aorta open and blood enters the aorta. The sudden increased pressure causes the aorta, which is elastic, to expand. Two things cause the blood to flow from the aorta to the arteries downstream. The pressure downstream is somewhat lower than in the aorta and fluid (blood) flows from higher to lower pressure. Secondly, and most importantly, the stretched aorta contracts to its original size pushing the blood downstream, so it acts as a secondary heart! So, you can see how important this elasticity is! Each successively smaller set of arteries downstream act in the same way to keep pushing the blood through the tissues. What is normal blood pressure (BP)? From the above information you can see that the pressure in your aorta is higher than in your arm. So where we measure your BP is important. When someone has a heart catheterization, we measure the pressure in the heart and in the aorta. In everyday practice we measure it in the artery in your upper arm, which is transmitted to the surface of your arm. When the heart first contracts the BP is at its highest. 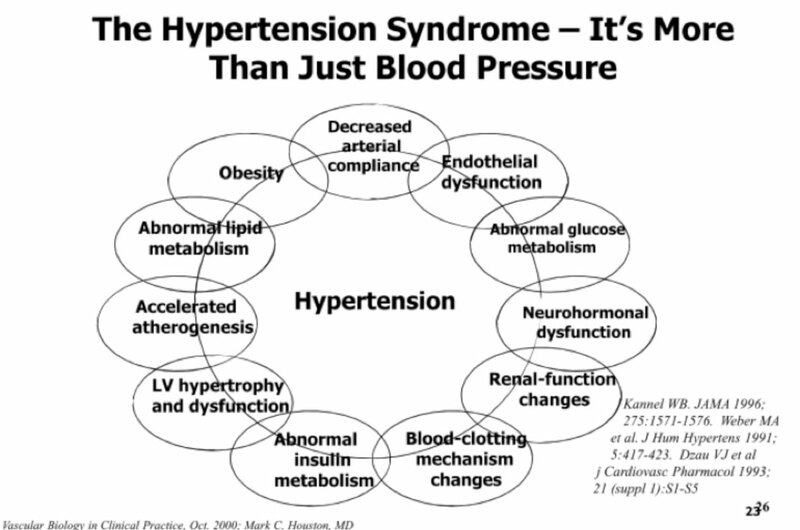 This is called systolic BP. Just before it contracts again, the BP is at its lowest. This is called diastolic BP. So, normal blood pressure measured in your upper arm is currently defined as: systolic between 90 – 119 mm Hg and diastolic between 60 – 79 mm Hg normally recorded as systolic / diastolic . (mm Hg = millimeters of mercury – the weight of a column of liquid mercury). A bunch of experts in the field get together and by consensus define “normal” and what is “high”. This group is known as the Joint National Committee on Prevention, Detection, Evaluation, and Treatment of High Blood Pressure. According to this committee there are several stages of high blood pressure. It used to be that you either had or didn’t have HBP. Now there are different stages? Well, it is even a bit more complex – and easier – than that! The scientific literature on hypertension has shown that over a BP of 115/70 there is an increasing risk that doubles for each 20/10 mm Hg increase in BP. “What does this mean for me?” If your blood pressure is 135/80 you have twice the risk (200%) of heart disease as someone with a BP of 115/70. At 155/90 the risk of heart disease is 4 times (400%) that of someone with a BP of 115/70! At 175/100 it is 8 times (800%) the risk. These numbers are greatly affected by other cardiovascular risk factors such as cholesterol, LDL, HDL, triglycerides, weight, diet, exercise, blood glucose, tobacco, alcohol and a number of other measurable risk factors. About 5% of patients with HBP have a single abnormality that can be pinpointed as the cause. For example, if the artery going to one of the kidneys is narrowed or blocked there won’t be enough blood flow to the kidney and it will send chemical messengers out to raise the BP to get the right amount of blood flow to it so it can do its job correctly – clean the blood of waste products so our bodies don’t get toxic. Another example is a tumor that produces abnormal chemical messengers that raise blood pressure. These are rare. These combined actions of not dilating well, inflammation that causes atherosclerosis especially when cholesterol is high, and calcium deposition in the arteries causes them to be “hard” – to lose their elasticity. (Remember the elasticity in the aorta makes it work like a second heart?) So, you can see that when the heart constricts forcing blood into an aorta and blood vessels that no longer expand – the pressure will go up! So what causes the oxidative stress and inflammation that leads to HBP? We avoid putting incorrect/unhealthy/toxic chemicals into our bodies – through our mouth, our lungs and our skin – herbicides, pesticides, heavy metals, tobacco, sugar, high-fructose corn syrup, processed foods, some medications that cause nutritional deficiencies, etc. Exercise – for some reason we are wired to “use it or lose it”! Exercise, in the right amounts, increases all the hormones that cause our cells and bodies to be healthy. One other way that the right micronutrients, macronutrients and exercise work is that they turn on anti-oxidant genes and turn off inflammatory genes! Amazing, Right?! Why is controlling my blood pressure important? Does this mean, if I have HBP, I can improve it with the right nutrients and lifestyle? Absolutely! A recent study out of Vanderbilt shows that micro and macronutrient deficiencies, which can be measured and corrected and some genetic “deficiencies” (for example enzymes that don’t work as well as they should because of minor or moderate mutations), which can be overcome by increasing the enzyme’s micro or macronutrients in combination with lifestyle changes allowed 62% of the patients to control their BP without medication! These changes will also likely help with other chronic diseases you may have like type 2 diabetes. This is great news for you, if you are among a majority of HBP patients who have a nutritional deficiency or a correctable genetic cause for your HBP. It is important to identify the deficiency with functional micronutrient testing or genetic testing. Please do not stop your medications on your own and to have a doctor monitor and guide you through the proper steps.